Love the design of this Hillestak chair from the 50's. It too would make a fun accent chair in almost any living space. 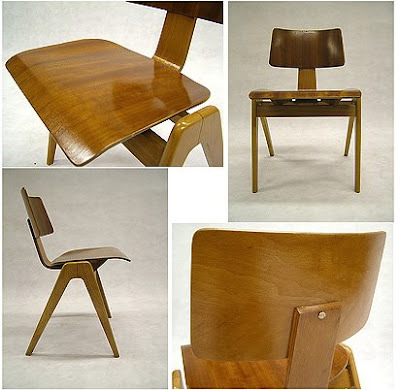 However, this chair is much more difficult to find than the Eames Plywood chair I love so much. I wonder if DWR would ever pick this up. Ebay doesn't currently carry any but never say never with Ebay. Anyone tried out their email search option? Type in a search, save it, and opt to have an email sent to your inbox when the item surfaces on Ebay. Pretty sweet. I found one here but since I'm not a "member", I have no idea regarding the pricing. Knowing her luck, she'll find one on Craigslist in Seattle! I love chairs like this. There is such a sturdiness to them and a real link to the era. They were meant to be used a lot and to look good at the same time. i'm swooning over this chair! There are 8 in the attic. Not so practical, the glue in the legs dries out.